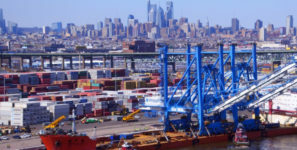 BIG SHIPS ARE COMING TO VIRGINIA AND BRINGING CORRESPONDING AMOUNTS OF CARGO: Those realities coupled with expansion projects make for a very active spring at The Port of Virginia. Port of Virginia records busiest April to date. COSCO Development was the biggest containership to ever call a US East Coast port. is growth of 4.6 percent when compared with the same month last year. The port has handled at least 220,000 TEUs every month since October 2016. The continued growth came as Virginia’s governor, transportation secretary, commerce and trade secretary and representatives of the OCEAN Alliance’s members welcomed the COSCO Development, which at 13,092 TEUs, is the biggest containership to ever call Virginia and the US East Coast. After transiting the Panama Canal, the ship made its first East Coast port stop on May 8 at Virginia International Gateway. Loaded Export TEUs in April totaled 85,623 at the Port of Virginia, up four percent. Loaded import TEUs came in at 101,114, up 9.4 percent. Containers reached 128,321, up 5.4 percent while rail containers equaled 46,367, up 4.3 percent. Barge containers were at 3,749, up 41 percent; truck containers numbered 78,205, up five percent, and the Richmond Marine Terminal handled 1,967 containers, up 39 percent.